Giáp : the victor in Vietnam · One Book. One Author. One Hour. Notes on front endpapers: Giap "not trained by OSS" p. 35. 1858 French landed at Da Nang. 1893 annexed Laos/Cambodia. Public opinion--North understood/US did not. Roosevelt offered Vietnam to Chiang Kai-shek. 29 Aug 45--Ho forms first admin. p. 60. British Gen. flaunted his powers in Saigon. Ba Hanh--Giap's 2nd wife--4 children. Giap played the piano/read a lot. Underlinings/notes: Vietnam 1,000 miles long--13,000 square miles. 28 Aug. 1911--Vo Nguyen Giap born. General in supreme command of army for 30 years. Began with 34 soldiers--ended up commanding nearly a million. Undefeated. Came from poor family of farmers. Buddhism--base religion in home, and Confucian ethics. Elder of 2 sons, 2 sisters. Attended French administered school. French official language until 1954. Attended school with Nguyen Sinh Cung--1943 changed name to Ho Chi Minh--the One Who Enlightens.1930s 80% of Vietnamese illiterate. Studied Napoleon, Lenin, Marx, Engels and Mao Tse-tung. 3 May 1940 went to China with Pham Van Dong. Giap, 29, met Ho in China. Ho--motivation of masses first priority. 1942 Giap attended courses at Kangta, political/guerrilla warfare school--lived in caves. Masses--motivation key to success. Cadres--high morals not indulge in decadent life of exploiting classes. Inner certainty--did not feel pressure to achieve quick results. By end of 1943 several hundred men/women joined National Salvation Army. 1943 wife died--life ruined. Sept. 1944 Vietnam Liberation Army formally formed with Giap as commander. 1945 Giap wounded in leg--Dong Mu. 1945 Japanese control. American (OSS) Deer Team. Lieutenant Colonel Peter Dewey first of 60,000 Americans to die in Vietnam. US worked with Vietminh against Japanese. 1407 Chinese of Ming dynasty reconquered Vietnam. Ho Chi Minh--23 aliases. French 1858 Da Nang. 1897 French rule over whole country--Paul Doumer disregarded protectorate status of Tonkin/Annam. Toward end of colonial regime large landowners of Cochinchina--2.5% of the people--owned more than 45% of the land. Between 1920-1939 62% of imports from France. Hong Kong, 1930, Nguyen Ai Quoc (Ho Chi Minh) jailed two years by British. 1936 Tonkin, party operated under cover of Indochinese Democratic Front, led by Phan Van Dong and Vo Nguyen Giap. Men 5'2". Roosevelt antipathy to colonialism. Roosevelt offered Vietnam to Chiang Kai-shek, leader of Chinese nationalists. 28 Aug.1945 Giap marched into Hanoi. 29 Aug.1945 as Japanese officers strutted around Hotel Metropole--Ho Chi Minh took over Vietnam formed 1st administration--proclaimed independence. America was a good friend of the Vietnamese. Vietnamese for the Vietnamese. 9 Sept. 1945 implementing Potsdam decisions--152,500 men of the Nationalist Chinese Army under General Lu Han marched over border, on to Hanoi. Brits sent troops. Lord Louis Mountbatten kicked out Vietnamese delegation. British--interventionists. Jacques Phillipe Leclerc--dry, humorless, bigoted man, rigid outlook; Giap called him unfrocked priest. Leclerc snubbed Giap. 1946 French signed away French prewar rights in China. Giap closed all newspapers--deployed Vietminh units against nationalist troops with support/participation of French Army. Nationalists more militant/greater threat than the communists. Giap, ruthless killer. Married Ba Hanh. Haiphong--6,000 people killed. Reputation for ruthless squandering of lives. 1951. Bigeard, 38. Giap's headquarters issued new field manual--need 3-1 superiority manpower, 5-1 superiority firepower. Giap helped/advised by Chinese. Giap's numbers--37,500 combatant troops; 10,000 teeth-arm soldiers. 50,000 uniformed commissariat troops. 300,000 people dedicated to communication. 1st equipped with American 75-mm howitzers; 48 American 105-mm howitzers captured in Korean war. John W. (Iron Mike) O'Daniel, commander of American army in Pacific visited Dien Bien Phu, wrote report for Joint Chiefs of Staff. US $385 million to fund Navarre plan for creation of reserve and bigger National Army of Vietnamese. Ho letter. Giap in Hanoi until end of 1950s. Giap admitted grave errors. Ho's history. After indoctrination in Moscow, in 1925 sent to China as agent of Commintern. Not much known about Ho Chi Minh in 1930s. Le Duc Tho 3 months younger than Giap. Truong Chinh. Ruled in accord with 2 principles--1. ministers mutilated--4 different ministries; 2. Leadership within ministries was collective. Generals--Army of Vietnam--poverty. Jan.1959 acknowledged existence of units in South, authorized buildup of forces--for reunification. Domino theory--voiced prior to April 1954, during National Security Committee in Washington. 1950 750 US military advisers in South Vietnam. Diem. Sir Robert Thompson. 60% of US aid to S. Vietnam embezzled/diverted from intended use. LBJ determined to block spread of communism--genuine irrational fear. Knee jerk--Tonkin affair. South Korea paid nearly $1 billion by US between 1965-1970 to send 22 battalions. American POW--do not mistreat prisoners. North Vietnamese treated prisoners as criminals. Giap, Westmoreland read works of SunTzu, von Clausewitz. At one point 51,000 US civilian contractors working in S. Vietnam. US no clearly defined political aims in Vietnam. 5,000 helicopters each costing $250,000. Special cooker--Hoang Cao cooker. Killing 5 Americans=nominated as Valiant Hero 3rd Class; killing 10 awarded 2nd class; killing more than 10, 1st Class heroes. Able to get Americans as they returned for comrades. Could fight/withdraw whenever we wanted. Ho Chi Minh Trail--Regiment 559 created to open/maintain trail. 21,000 tons of bombs dropped in 1 month on a 2-km section of the road. 15% of bombs dropped failed to explode. Kill ratio 1 Vietnamese for every 300 bombs. 1968 Tet. Westmoreland says need 3 times as many troops as at peak of deployment to force Giap into conventional mode. 1969, USAF reported loss of 800th aircraft. 22 Feb. highest weekly total of American combat deaths--543. 3 Sept.'69 Ho Chi Minh died in Hanoi at 79. 5,200 Allied troops died; 4,407 South Koreans, 469 Australians and New Zealanders. Between 335,000 and 415,000 S. Vietnamese civilians died. Giap admitted 600,000 casualties. 2.5 million North/South Vietnamese died out of combined population of 32 million. N. Vietnam 3rd largest army in the world. April 29, 1975 last Americans left Vietnam. People rather than army won the war. Most successful guerrilla leader of all time. Made timing, surprise, camouflage and deception understood/applied by his soldiers. Self-control. Slavishly followed Ho Chi Minh's version of Marx and Lenin. 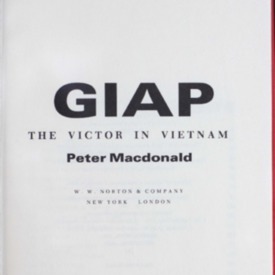 Macdonald, Peter G, “Giáp : the victor in Vietnam,” One Book. One Author. One Hour., accessed April 19, 2019, http://booknotes.gmu.edu/items/show/263. Program air date: August 29, 1993. A portrait of one of the greatest military commanders of all time--from his early days as a resistance fighter against the Japanese through the brilliant campaigns against the French and Americans that established his reputation. "Vietnam. Quân đội nhân dân--Biography."